So you want to bless the homeless or those less fortunate than you, but you don’t want your efforts to be counterproductive. 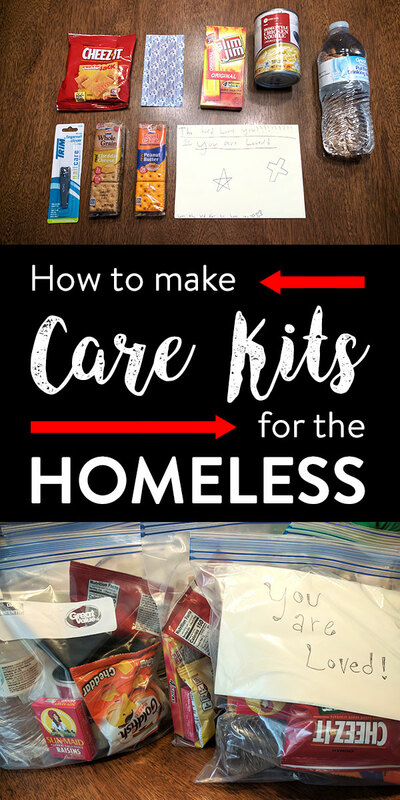 What should you put in homeless care kits that will actually help a person in need? Below, we will take a look at what goes in to a good care package, how to choose the right resources, how to put it all together, and tips for giving them out. Socks. Nice, high-quality, thick socks. Wool or thermal socks are best. Gloves. Again, one good quality item will be a much greater blessing than several low-cost items. What to avoid: Cheap socks, cheap gloves, and most clothing items in general. It is hard to judge a person’s size, and there are many shelters and ministries that provide decent used clothing (include a list of such places in your care kit), but good socks and gloves are a huge necessity and much harder to come by than, say, a t-shirt. What to avoid: Soap, hand sanitizer, mouthwash, anything with fragrance, large items. Soap, because anywhere they can get a shower will likely offer soap. Hand sanitizer and mouthwash because they have alcoholic content and this is not a good idea for potential addicts. Frangrance, because it is insulting and many people have sensitivities. Large items, because they are difficult to carry. What to avoid: Gum, nuts, or anything difficult to chew. Many homeless individuals develop dental issues, so it is best to start with things that are easier on the teeth. After all the research and asking professionals and trial and error, here is my personal rendition of a light, tight homeless care kit that packs the most amount of blessing in the smallest amount of space. This also balances cost so you can afford to give out more. Total cost: $7-10 per pack, depending on actual price and if you get bulk. Let’s take a little closer look at each item. You’ll want to start with a nice zipper plastic bag. Why the zipper? The regular types tent to stop sealing after opening and closing a few times. Spend the extra pennies to get the nice ones, and the person who receives this will get a bonus reusable bag they can use to store important personal effects after they use the items from the care kit. It is very important, IMO, to write a note by hand. Why? It shows that you care. Just like a hand-written thank you note, hand-written invitations, or anything else. Don’t put a tract inside. Everyone sees those like junk mail – one glance tells you what it is, and it gets tossed. Instead, write why you are giving this care kit, that you love, care for, value them, and include a Bible verse or prayer of blessing. This will go much further than a tract that you spent zero effort on. For our kits, we had blank cards with envelopes in which we wrote Bible verses and notes of encouragement. The kids helped out, copying down some verses and also coming up with their own encouragements. We thought that having several people write in a note was a good way to show that more than one person is caring for the recipient through each package. Just make sure you think through what you write so that your notes don’t sound condescending, and proof anything written by kids. Additionally, along with the note you can print a list of local homeless resources. Where they can get a hot meal or shower, a haircut, help with jobs or addiction recovery, a bed for the night, clothing, restrooms, and anything else. Contact the local shelters and ask them for recommendations. We listed the contact info for the nearest (and to our knowledge, best) shelter in the area and printed it, four to a page, then cut them out and slipped one into each card. The note included some details of what the shelter offers – lodging, showers, food, haircuts, addiction recovery, etc. Once again, this is simply the #1 most needed item. Durable, warm, cozy, high-quality socks are a must for people who walk almost everywhere in the thickest boots they can find. You can go cheap on everything else, but don’t skimp on the socks. Proper hydration is difficult when you are out on the streets. A water bottle takes up a lot of space in your care package, but they can drink it right away or toss it if they need to. If they need the water, it is at very little cost to you and a huge, huge, immediate blessing. If they don’t need it, again, very little cost and very easy to toss. These little packs have good protein, include carbs, keep for a while, don’t melt, and are delicious. You can also substitute other protein and carbohydrate-rich foods like individually packaged beef jerky/sticks or peanut butter crackers. A simple tool that is easily taken for granted. You can get them at the dollar store or order in bulk online for less, and it will be a much-appreciated and used item. Primarily for blisters. Think; if you are on your feet all day, walking everywhere you need to go, how often are you going to get chafed skin, blister, and sores? Get a bulk pack of large 3-4″ bandaids and divide them up in little baggies to go inside all the homeless care kits you pack. Another no-brainer, once you think of it. A small, portable, handy, and appreciated luxury. Go for the individually wrapped ones. Try to keep the bags small. Not everyone can carry around a lot of stuff, so aim for fewer but better items. Write a personal note. Write – in your own handwriting – a card that says their welfare is important to you, that they are loved, that you are praying for them, that they are valued, etc. Feel free to mention why you are doing this; perhaps as an expression of your faith, because you’ve been there yourself, etc. Include a list of resources. Addresses for the local gospel rescue mission, men’s shelter, women’s shelter, places they can get meals, shelter, and showers, where they can receive emegerncy medical services, and more. Contact your local shelter and ask them, as they will be an invaluable resource with a hands-on knowledge of the needs of the homeless in your area, plus what resources are available. Take your time. Pull the car over and get out and talk if you can. Ask their name, their story. A hand-delivered care package, a few minutes of conversation, a smile, genuine eye contact, all this can go a long ways towards showing someone that they are important, valued, and loved. Ask to pray with them. Not everyone will say yes, and that’s ok. Respect their wishes, but if they say yes, pray for them and that they would be blessed. Also pray before and after you give the care package. Be safe. Most homeless men and women are not dangerous. They are people just like anyone else. Still, it is wise to be in a group when handing out care packages, especially if you are going to stop and get out.